See also: Shackleton Dome: Is a Domed Lunar City Possible? 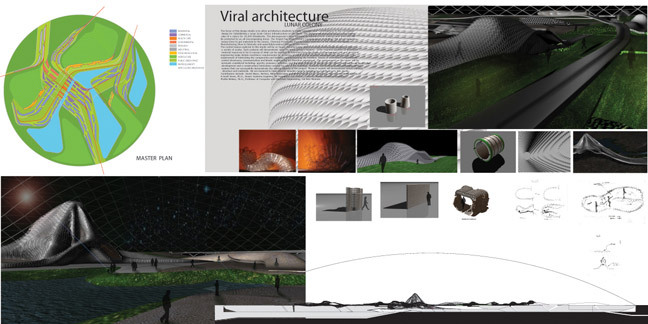 “Viral” architecture is based on structures that replicate and build themselves. 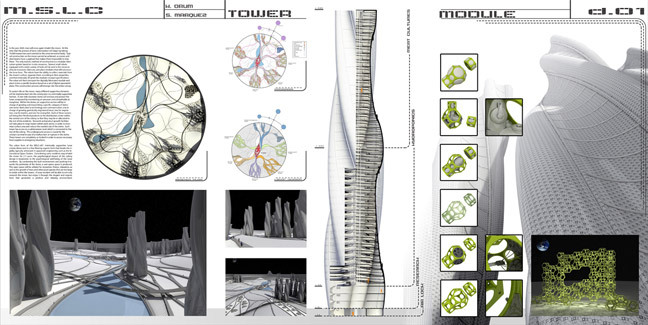 This 2008 project proposed and researched small, self-replicating robotic modules which would gather in-situ lunar materials and create more of themselves. These robots would actually be the common building blocks for the entire settlement. The focus of this design studio was to allow architecture students to make valuable contributions to a conceptual design for a master plan of a lunar settlement for 10,000 inhabitants. 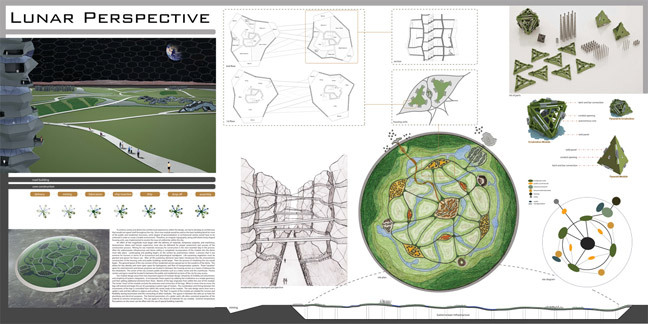 The aboveground settlement would have an underground infrastructure and would be protected by an all-encompassing dome. The project had three primary considerations: trajectory issues (how to get materials to the Moon), chemical processing (how to make materials on the Moon), and space manufacturing (how to fabricate and assemble/construct things on the Moon). Final presentation boards by participating architecture students in the project are shown below. More information about the project can be found below the images. Following is a description of the MSLC concept immediately above. Typical construction on the Moon cannot be achieved, as cranes and steel beams have payload weights that render them impossible to be shipped to the Moon. The only realistic method of construction is a modular fabrication system based on in-situ resources. Several small robots equipped with a wide variety of tools will be sent to the Moon to allocate resources and fabricate and place modules that will construct the lunar settlement. The robots have the ability to collect the materials from the Moon’s surface, separate them according to their properties, and then internally 3D-print the modules to exact specifications. The robot will then transport the digitally fabricated module and place it in its specific location based on a set of digital parametric plans. Issues of embedded computational control structures, communication and kinetic engineering are therefore paramount. The environment on the Moon must be considered including: gravity, pressure, radiation, and the mass balance of resources and waste required for sustaining human life at such a scale. Also needed is to demonstrate efficient urban planning which includes human and environmental interaction, sociology and psychology, and medical care. To sustain life on the Moon, many different supportive elements are implemented into the settlement plan in a minimally supportive fashion. A one-mile diameter dome will enclose and protect the lunar compound by maintaining air pressure and a breathable atmosphere. 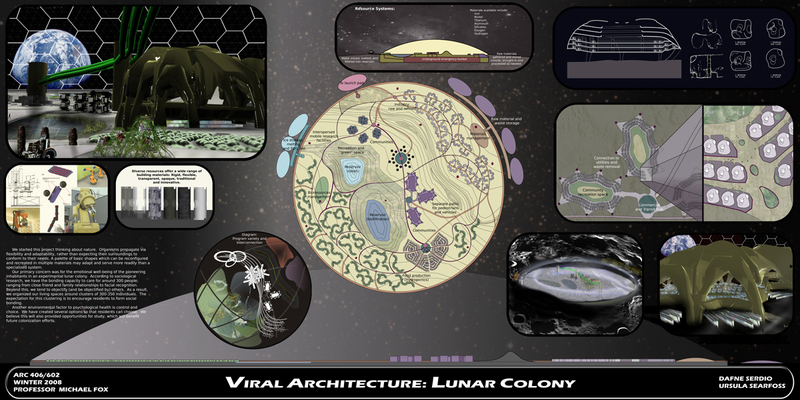 Within the dome are a residential sector and six supportive sectors in charge of supplying or researching a specific category of items: one sector is dedicated to technology and communication, one is in charge of growing genetically engineered meat, two are for growing vegetation, one is for textiles, and one is for raising fish. Each of these sectors will bring their finished products to the distribution center within the central core of the settlement so that they may be re-allocated to the rest of the residents. Research and product growth facilities will take place in large towers within each sector, in order to maximize surface area and reduce the needed size of the dome. Each tower has access to a subterranean level which is connected to the rest of the settlement. This underground access is crucial for the occupants’ survival in case of a malfunction or rupture in the dome. These towers are completely air-locked in order to access necessary food supplies in emergency situations. The settlement is a free-flowing organic form that breaks the rigidity typically witnessed in spacecraft engineering such as the International Space Station. 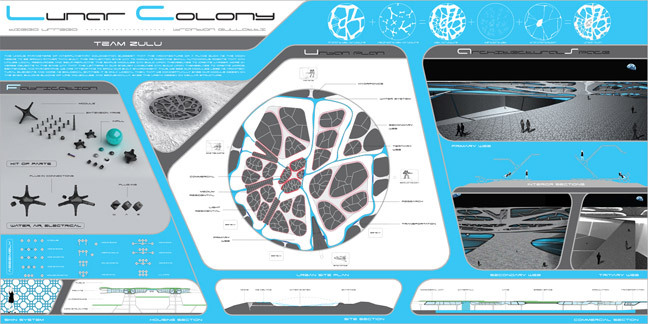 Considering that some residents may inhabit the Moon for 2-5 years, the psychological impact of the settlement design is important to the well-being of the lunar residents. By condensing the built-up environment and pushing it towards the perimeter of the dome, a vast open space is produced. This open space will be utilized for recreation, fitness, relaxation, as well as the growth of trees and other plant species that are too large to reside within the towers. A lunar resident will be able to not only research the Moon, but enjoy it through the elegant and organic form that generates a positive and relaxing environment. Design studio based on the “Viral Structures” concept of Edward D. McCullough, Principal Scientist at the Boeing Company, presented as “Establishing Large Scale Colony Infrastructure on The Moon” at the 26th International Space Development Conference in Dallas, Texas, May, 2007. Contributors Include: David Nixon, Partner, Altus Associates architects, Founder and Chairman, Astrocourier Ltd. (Ireland); A. Scott Howe, Ph.D., Senior Systems Engineer, NASA/Caltech Jet Propulsion Lab Mission Systems Concepts; Phyllis Nelson, Ph.D., Professor of Computer and Electrical Engineering, Cal Poly Pomona. 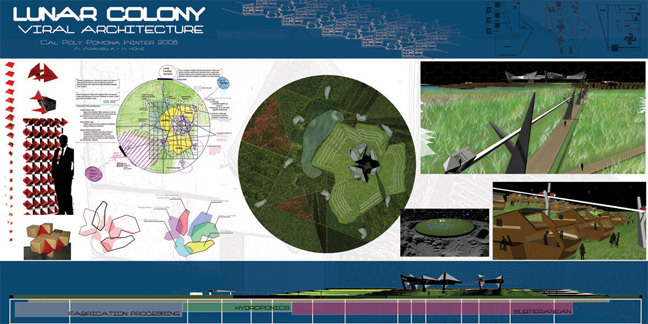 Space Architecture bibliography consulted for this project.